New tax bill allows bed tax to be spent on transportation and gives TBARTA $1 million. Author:In Search of Robin, So You Want to Blog. In a last-minute move Senator Jeff Brandes R of St. Petersburg managed to get some transportation language added in the tax cut bill approved by the State Legislature. You can get some addition detail in a Tampa Bay Times Editorial: Editorial: 2 smart transportation investments for Tampa Bay. The editorial goes on to point out that the Legislature also included $1 million in the 2018-2019 that would be used by the Tampa Bay Area Regional Transit authority to produce a “regional transit development plan” for the Tampa Bay area. Raiding the bed tax, which is primarily used to develop tourism, the bay area's largest income steam, is generally a bad idea. Although the language in the legislation provides some safeguards, unless there is a significant oversight, you can bet this will become a honey trough for the light-rail hogs. The thought of getting their fingers on some of that bed tax money probably has a number of local politicians staying awake at night trying to figure out how they can divert these funds to their use. 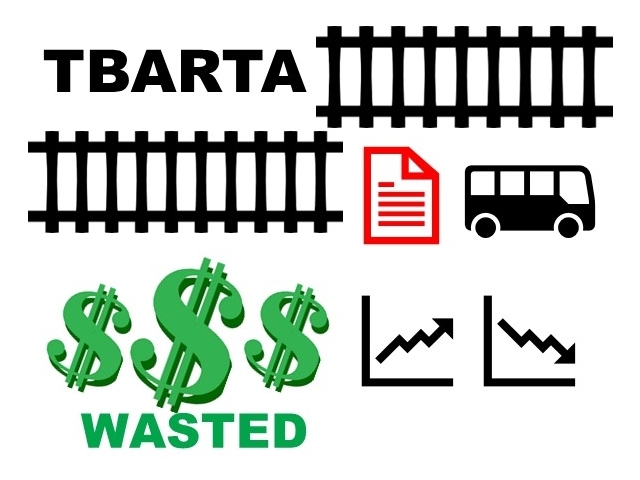 The $1 million to TBARTA is a complete waste of money, although it does empower TBARTA to do what it does best: waste money on endless reports and bountiful consult fees. In over two decades of effort, TBARTA has nothing to show for its voluminous reports and numerous meetings, and it is very unlikely this new million-dollar effort will be any different. My guess is this money will be directed at developing a series of reasons that the recently proposed inter county rapid bus service should be should be slowed down until a light-rail plan can be wrapped around it. 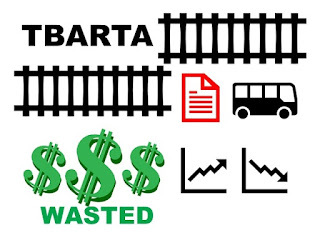 The recent re-tooling of TBARTA had little effect on the overall TBARTA goal of light rail as the only transportation solution for the Bay area and suggestions from numerous TBARTA supporters and politicians that we need to “slow down” the bus rapid transit project is a harbinger of what this money will be directed at supporting. I am not sure what motivated Senator Brandes to promote this legislation, but I seriously doubt the results will anything close to what he envisioned.